Today we're back with Survivor Historian slash RHAP staple Mike Bloom at the fish shop to break down who's popping tags, who's stunting, and who got the come-up of a lifetime. In a week where so many solved the Main Match, was the game flaaaawed? Who's in the best spot now to end up on top in a world that suddenly seems so upside down? What might an American version of The Genius look like? And honestly, how is this show not scripted? All that and more when listen here or download this week's episode on Google Drive because our regular server is apparently about as useful as a one-dollar squid. 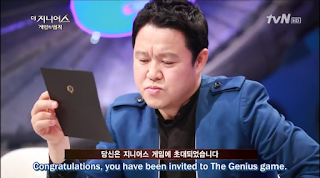 Today's menu is pain and devastation as we break down Episode 3 of The Genius: Grand Final. What are the larger ramifications of this week's shocking result, and just how shocking was it? How thoroughly destructive can K-Hound be in a world where no one will talk to him? And with the sudden change in landscape, how likely are we to see S3 redux and who might take the lead in preventing it? 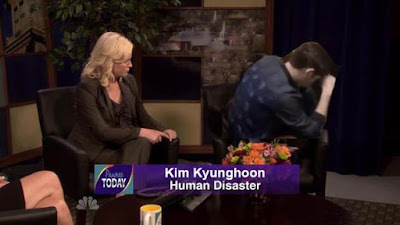 All that and more on this week's show, which you can listen to here or download directly via Google Drive below along with all of our other S4 podcasts since our normal hosting site is totally Kyunghoon-ing us right now. In this week's episode, reality podcasting sunbae and confirmed #Kyungfan Jay Fischer has some juice with us as we break down the Horror Race. Why did Team Jinho enjoy the best outcome despite losing the game? How did the GOAT Starcraft player get outmanoeuvred by the joke of the cast? And should Yeonseung have seen this coming? All this and more on this week's show, available below, here, or on iTunes here. The wait is over and the instant classic season premiere of The Genius: Grand Final is in the books. Today we're back to give our takes on ID Exchange, break down what kind of a start each of the players got off to, examine the merits of the bold moves of the week, and project what the bigger picture ramifications of those moves may be (if any, because usually there are absolutely none for him. It's honestly ridiculous). As always you can listen on the player below, find the direct link here, or find us on iTunes here. 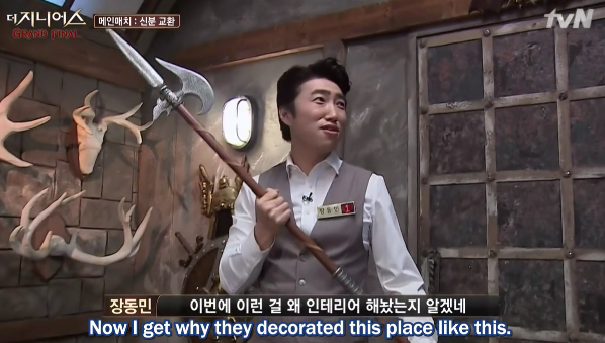 Watch Gura, Jinho, Doohee, and Sangmin on that other show here. In a massive stroke of good fortune earlier this year I stumbled across The Genius, which for my money is the best reality competition show on the air. It demands a lot from its viewers, especially those lacking knowledge of Korean language and culture, but it's uniquely stimulating and entertaining. The cast features 13 players deemed to have an exceptional skill or talent - entertainers, musicians, politicians, lawyers, gamers, and students at Korea's top universities. Each week they compete in games designed to test their intelligence, social awareness, and adaptability. The loser of the week's main match chooses an opponent for an elimination match and the two square off to see who comes back next week. Negotiations are enabled by 'garnets', which act as an in-game currency and often change hands very quickly as players scramble to buy safety or loyalty. Despite the lack of surface-level diversity the cast features an interesting mix of personalities, jazzed up by familiar faces from the music, TV, and film industries. The reliance on celebrities may raise eyebrows for Western reality fans, but it works well here. None of them are so closely tied that the game could damage professional or personal bonds, but there's enough familiarity to create a jovial atmosphere and their castmates don't place them on a pedestal. With experience on similar shows, the celebrities are in their element and can play and perform to a higher standard while retaining a sense of perspective about the game. They are also successful enough that the show's relatively small prize pot - winner takes all, usually $60-80,000 - doesn't make them risk-averse during the games. The regular contestants also conduct themselves well. Even those who are clearly heavily invested in winning don't unload their frustrations onto others. You never see the post-game recriminations we all recognize from exit interviews, or the personal attacks that are all too common in reality competition shows; it often feels like they are there to make friends. Despite this, there's no shortage of drama or suspense; and because of this, it's easier to fully enjoy it without feeling uncomfortable. The Genius demands very little from its players: you don't need to leave your job, family, and friends for months to live with strangers in unusual conditions, you just have to show up for filming once a week. Other shows create drama by depriving people of everyday comforts and throwing them in high-pressure situations; The Genius has faith that good casting and game selection in a welcoming environment is a recipe for great TV. Where other shows bring out the worst in people, The Genius brings out the best. The games test a wide range of skills, from the political - an early episode hosts an election, with all the trickery you would expect - to the practical - a seemingly straightforward game might have a secret 'hack' that forces players to channel their inner magician. Most games hit the sweet spot of being conceptually simple but complex enough to merit detailed analysis. The show breaks down the rules and the players' strategies while giving you credit to figure things out yourself and omitting enough to keep you guessing. A large part of the fun is playing along at home, working through all the angles and predicting what twist might come next. Many matches are adaptations of common board games or party games, and others would be easy to recreate with friends (or more formally, as fellow Genius podcaster Scott Green proved with his successful Kickstarter campaign). There are no permanent friends or enemies in The Genius, as today's game might have you working with the people you tried to take down a week ago. Alliances are amazingly fluid, and anyone who doesn't force themselves into the action gets lost in the shuffle; by the endgame, even the 'floaters' have made tough choices and fought for survival. There's less room for a player to dominate: you can lead your group to a win and still be dragged into a deathmatch, and you know your competition will be taking shots at you every week. When a player goes on a run or keeps their alliance intact over multiple rounds, it's a legitimate achievement. Even a player who isn't popular with the group can find themselves thrust into a key role or have a chance to prove themselves in deathmatches. The show has a refreshing sense of whimsy, constantly poking fun at itself and its contestants. The music choices are occasionally bizarre but always funny, and the captions and images add a nice touch. A highlight of every episode is the banter between the players before the game starts, in contrast with some Western shows where only the host has a voice 'outside' the game. The action takes place on a self-contained set, complete with hilarious supposed-to-be-American decor choices; and the master of ceremonies is no Jeff Probst or Phil Keoghan but rather a scary computer avatar who sounds like he's delivering a ransom note through a voice scrambler. Especially for Western fans who are new to variety shows, the quirks of Korean culture make it that much more enchanting. The Genius is a heavier commitment than most shows - episodes are long, and the subtitles and level of detail demand your undivided attention - but it's absolutely worth it. If you're a reality competition fan, or even a traditional game show fan turned off by that label, The Genius is for you. Everyone we have introduced to the show has fallen in love with it, and we urge you to watch and join the conversation. Fighting!